Hungarian ancient gold and silver coins began their history from the middle of the XVIII century. 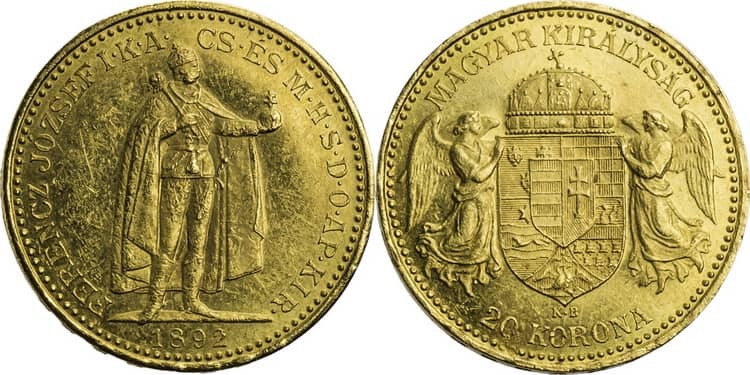 The uneasy formation of the Hungarian state experienced many economic ups and downs, and the periods of reign of different kings were reflected in the design of coins. 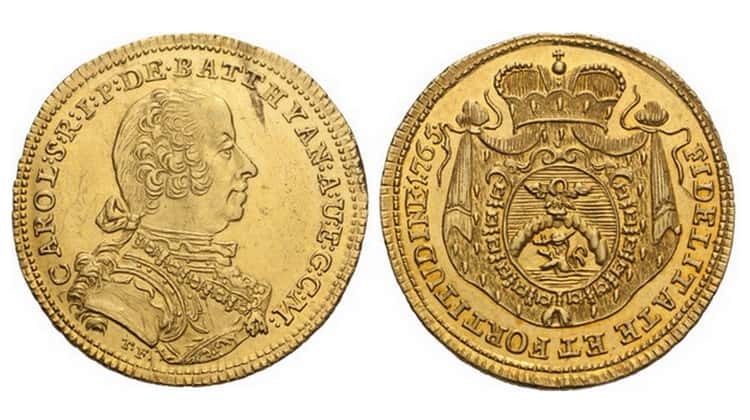 All 1740-1780 Maria Theresia Hungarian gold coins in our catalog. All Hungarian gold coins in our catalog. All 1848-1916 Franz-Joseph 1 Hungarian silver coins in our catalog. 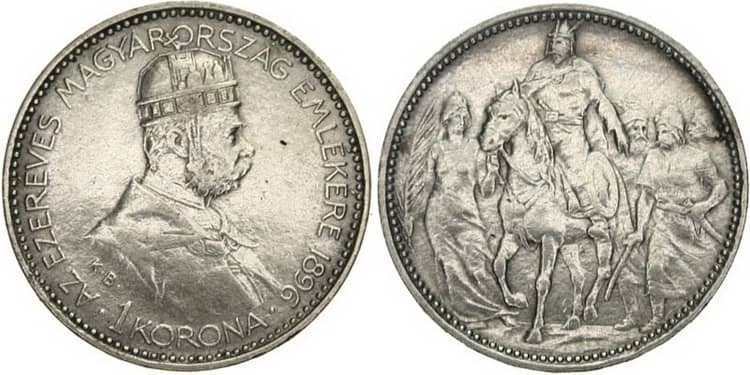 Hungarian korona of Franz Joseph I, 1892-1914. All Hungarian silver coins in our catalog. 5 korona denomination (standard coin of this value). 100 korona denomination (standard coin). All 1848-1916 Franz-Joseph 1 Hungarian gold coins in our catalog. 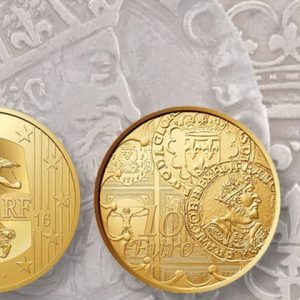 As for the design of the ancient Hungarian coins, it reflects the epochs of the rule of Hungarian kings, showing symbols of power and heraldic emblems. 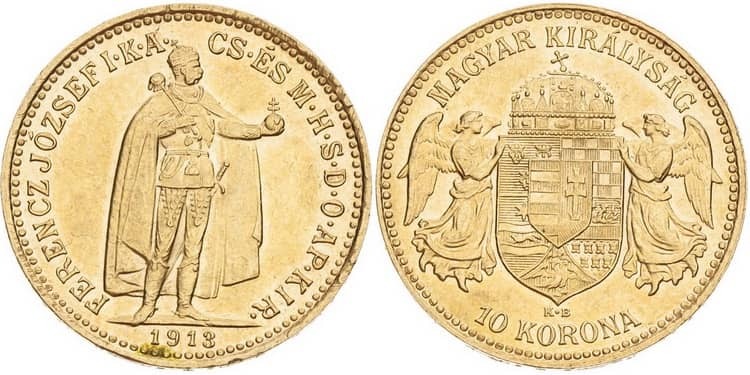 The inscriptions on the coins were always minted in Hungary, and the identification of the state on some coins was marked with the inscriptions “MAGYAR” or “MAGYAR KIRÁLISÁG”. A distinctive element of many Hungarian coins is the image of the crown of St. Stephen, which is still kept in the Parliament of Budapest. You can also find the labels of one of the mints on the coins − most often it is “K” or “K * B” (Kremnica). The minting of the first Hungarian coins was begun by King Saint Stephen I in 1001. Ancient Hungarian coins were minted at various Mints, the most famous of which is the mint in Kremnica city, which is located on the territory of modern Slovakia. Here the Hungarian coins were minted until the beginning of the 20th century. 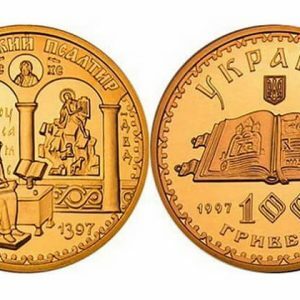 Moreover, the coins were minted in Nagybanya (today it is the city of Baia Mare in Romania), in Smolnok (today it is Smolnik in Slovakia) and in Karlsburg (today it is Alba Iulia in Romania). After the collapse of the Austro-Hungarian Empire, the entire Mint was transported to Budapest and began its work in 1920. Officially, the Hungarian Mint was founded in 1925 and became known as the Royal Hungarian State Mint. In 1949 it was renamed the Hungarian State Mint. In 1992, the Mint was transformed into Hungarian Mint LLC. Initially, the Hungarian National Bank owned only a major share of the Mint, and since 1998 it became its only owner. 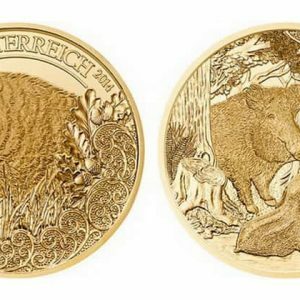 Several factors can affect the cost of ancient Hungarian gold and silver coins: rarity (the number of surviving copies), the condition of the particular coin (absence / presence of scuffs, scratches, chips) and the demand for it on specialized numismatic exchanges. 5 silver forints of 1946 − 5-9 euro. The name of the coin “Florint” is derived from Florence − an Italian city in which gold coins “fiorino d’oro” were minted. In the period of 1806-1892, you can find another name of the Hungarian forint, which sounds like florin or gulder in German. The forint was reintroduced in Hungary only in 1946, after the hyperinflation of 1945-1946. In silver, only the 5 forint denomination was minted. 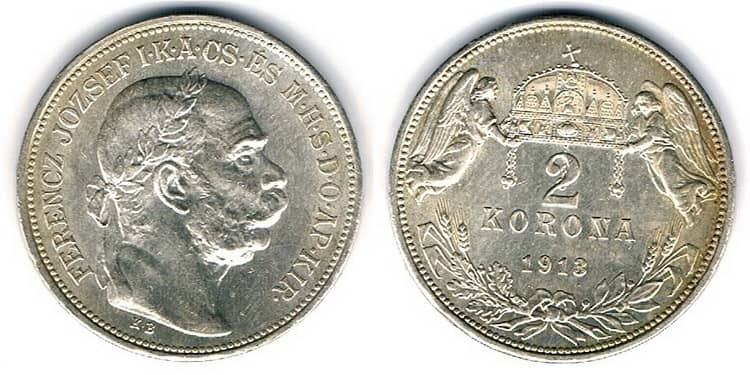 After the monetary reform on August 2, 1892, the mintage of silver and gold korona began in Austria-Hungary. Since the state was dual, the korona were divided into Austrian and Hungarian type. Korona of the Hungarian type contain inscriptions in Hungarian and depict the royal regalia of Hungary (the orb, scepter, the crown of St. Stephen). 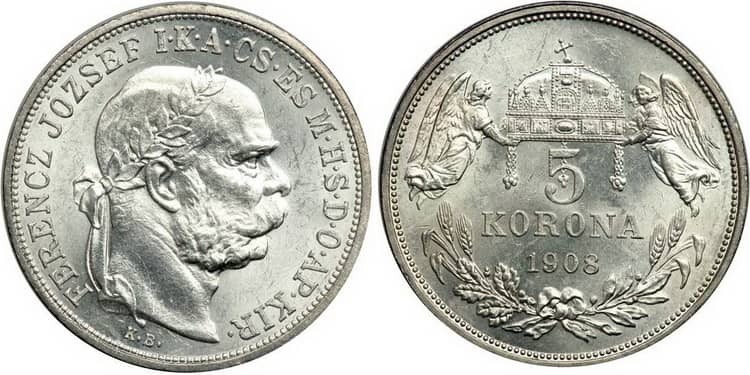 During the minting period of gold korona of 1892-1914, two commemorative korona coins of 5 silver and 100 gold of 1907 were issued, which are dedicated to the 40th anniversary of the coronation of Emperor Franz Joseph I., and a silver coin of 1 korona in 1896, dedicated to the Magyar Millennium. On a silver 5 forints coin of 1946 is depicted Lajos Kozut, who was a famous Hungarian statesman, revolutionary, journalist, lawyer, the Prime Minister and President of Hungary during the Hungarian revolution of 1848–1849. Louis I of Hungary was the king of Hungary from July 16, 1342 and was crowned on July 21, 1342 under the name Lajos I., and from November 17, 1370 he became the King of Poland. Matthias Corvinus I Korvin or Hunyadi Mátyás, who belonged to the Transylvanian clan Hunyadi, was king of Hungary from January 24, 1458. Under his rule, Hungary reached the peak of its greatness and power. In addition, from 1458 he was king of Croatia, from 1469 he ruled the Czech Republic and from 1487 − Austria. St. Stephen I, whose crown is depicted on many Hungarian korona, was the first king of Hungary (1000–1001) and canonized for introducing Christianity in Hungary. He was able to unite all the tribes of Hungary and establish the rule of the monarchy. The first Hungarian coins, which began to be minted under Saint Istvan I, were made according to Bavarian-style patterns. 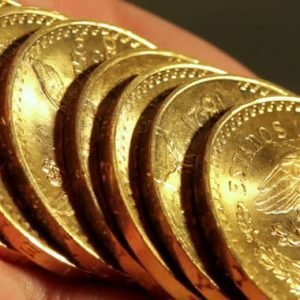 Newly made coins (the copies of coins) have the distinctive sign “UP” and are more likely investment, without representing special interest for coin collectors. In addition to the Hungarian korona of 1892-1914, which were made of gold of the highest standard, the remaining coins of Hungary were composed of additional impurities of copper, nickel or other metals.